Do you need to write an ‘About Me’ page? It’s one of the most important components of your portfolio, website, or blog. It’s where prospective employers, potential clients, website users, and other professional and personal connections go to learn about who you are and what you do. And it's an ideal resource for promoting your professional brand. Writing an ‘About Me’ page or section for yourself is never easy. However, the good news is if you follow the formula and tips below, you should be able to generate an engaging ‘About Me’ statement without too much of a struggle. Here’s how to write an ‘About Me’ page you can be proud of. 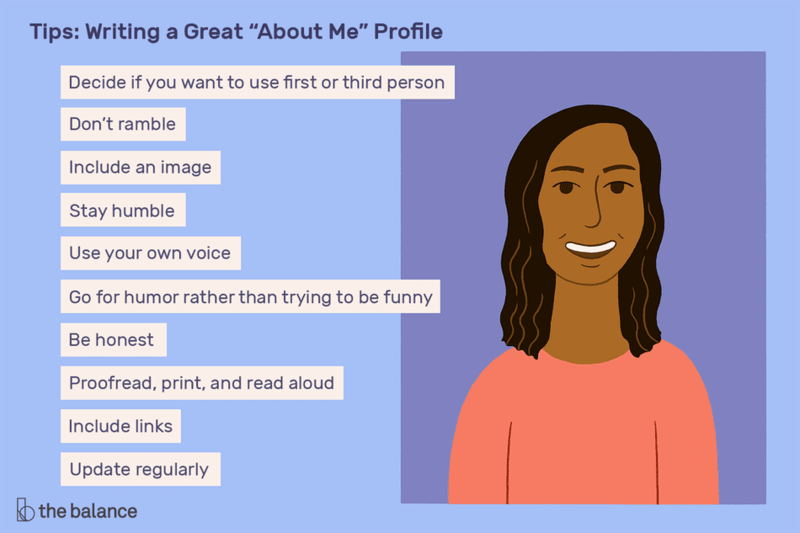 Should you or shouldn't you put the effort into crafting your perfect "About Me" page? Here are a few reasons why you should, (and maybe shouldn't) put the extra effort in. It's an ideal resource to promote your professional brand and yourself as an authority. Potential clients, employers, and others can go to your "About Me" page to find out more about you. Could lose traffic if your "About Me" page is focused too much on you and not on what you can offer your reader. Can turn people away if you don't respond quickly to comments or contact requests. Your ‘About Me’ page should convey who you are and what you’re doing, how you got there, and where you’re looking to go next. Use it to describe your credentials, expertise, and goals. What’s the best way to start? The following exercises can be helpful in figuring all of that out, and will help you determine what to include based on your target audience. Spend about five minutes on each question. You can use the ‘example’ answers to give you an idea of what that answer might sound like in its final form but be sure to use your own words. 1. What are you currently doing (in regard to your career) and how did you get there? How does your background make you unique? 2. In terms of the work you do, what aspects are you most passionate about and why? Madison is fueled by her passion for understanding the nuances of cross-cultural advertising. She considers herself a ‘forever student,’ eager to both build on her academic foundations in psychology and sociology and stay in tune with the latest digital marketing strategies through continued coursework and professional development. 3. What do you consider some of your biggest professional and personal accomplishments? How did your attributes contribute to those accomplishments? Be as specific as you can. Her hunger for knowledge and determination to turn information into action has contributed to her most recent success at Rockwell Group. There, she led international award-winning campaigns for heavy-hitting brands such as Puma, Gucci, and Rolex. Meanwhile, she vastly improved the productivity of her department by implementing strategic project management methods and ensuring a work-life balance for her team. Madison believes mindfulness in the workplace is key to success, a tenet she lives out through her interests in yoga, meditation, gardening, and painting. Madison is currently working as a freelance marketing director and is always interested in a challenge. Reach out to madisonblackstone@gmail.com to connect! Madison is a director of brand marketing, with experience managing global teams and multi-million-dollar campaigns. Her background in brand strategy, visual design, and account management inform her mindful but competitive approach. Madison is fueled by her passion for understanding the nuances of cross-cultural advertising. She considers herself a ‘forever student,’ eager to both build on her academic foundations in psychology and sociology and stay in tune with the latest digital marketing strategies through continued coursework. Her hunger for knowledge and determination to turn information into action has contributed to her most recent success at Rockwell Group, where she led international, award-winning campaigns for heavy-hitting brands, such as Puma, Gucci, and Rolex. Meanwhile, she vastly improved the productivity of her team by implementing strategic project management methods and ensuring a work-life balance for her department. Madison believes mindfulness in the workplace is key to success - a tenet she lives out through her interests in yoga, meditation, gardening, and painting. Madison is currently working as a freelance marketing director and is always interested in a challenge. Reach out to madisonblackstone@gmail.com to connect! Decide if you want to use first or third person. Should you use first or third person, what’s the difference, and why does it matter? First person involves the use of "I" statements as in, “I manage teams... ” whereas third person (as exemplified above) uses “he/him” or “she/her" as in "She manages teams ..." You will find “About Me” statements written both ways. Most important is that you choose one and remain consistent, rather than alternating between the two. If you’re writing the ‘About’ statement on a business website, it’s generally advised to use third person ("She supervises ..."). However, if your website is a personal portfolio or blog, it’s best to use first person ("I have ten years of experience ..."). Don’t ramble. Most likely, your reader’s attention span isn’t going to be very long. Try to keep your statement to less than 250 words. Include an image. If you’re promoting your expertise, consider adding a photo to your page. A professional headshot, like you use on LinkedIn, will work perfectly. Website and blog visitors like to connect a name with a face, and it will be more personable if your page isn’t all plain text. If your website or blog is about a product or service, include a related image. Stay humble. Although it’s important to include your accomplishments and your experience, do so in a reasonable manner, avoiding outlandish statements. Declarations like, “I’m the best marketing professional there is” or “Any company that brings me on board is lucky to have me” will certainly hurt you more than it will help you get hired. Use your own voice. Don’t use words plucked from the thesaurus or a business book. Use your natural voice, aiming to strike a balance between conversational and professional. You won’t be introducing yourself in the same way you would be to, say, someone you’ve just met in a bar, but you also shouldn’t sound like a politician running for president. Use a tone pitch you should use for networking. Also, be honest about your interests and goals. Go for humor rather than trying to be funny. In some ‘About Me’ pages, you’ll see that humor can be effective. However, avoid joke telling, especially if it doesn't come naturally. Don’t feel pressure to sound clever and entertaining. Instead, focus on coming across as approachable, friendly, and engaging. Be honest. Your ‘About Me’ page should reflect your genuine interests, whether they’re personal or work-related. You never know when someone might use material in your statement to strike up a conversation. For example, if you’re not really into yoga, don’t write you’re into yoga, or if you hate the account management aspect of your job, don’t write that you’re passionate about client experience. Proofread, print, and read aloud. Typos make you look careless and reduce the professionalism of your page. Carefully proofread your statement when it’s complete and ask a friend to do the same. Then, print it out and read it aloud. Not only will this help you catch typos or grammatical mistakes, but it is the best way to ensure the statement reads naturally and sounds like you. If anything comes across as awkward, funny, or simply doesn’t seem like something you would say, rework it until it sounds more like you. Include links when possible and relevant. Make sure your email address is a link. If you use the word ‘experience’ you can link that to your LinkedIn profile. If you mention any specific projects you’ve worked on, add links when you can, whether that’s a link to your portfolio, a positive news article, or even a blog post on your own site that discusses the experience. Remember that your ‘About Me’ page is a living document. Whenever inspiration strikes, you can (and should) come back and update the page to ensure it accurately reflects where you’re at in work and in life.